Most students are just a few weeks away from the new school year, and hundreds of thousands have already discovered the benefits of using the iPhone as their leading study tool. 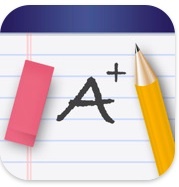 While the App Store offers numerous elementary apps that can serve as basic study aids, the right iPhone application can help a student stay organized or even build a research paper bibliography. It’s easy to be overwhelmed by the new school year. myHomework keeps you organized and on top of your assignments, upcoming tasks, and due dates. To keep things simple, assignments in various classes and respective due dates are color coded. No one can deny that high school is all about preparing for college. For those worried about the Scholastic Aptitude Test, the App Store offers a plethora of applications to guide them through the process. SAT Flashcards is a great app that will teach you more than 5,000 potential vocabulary words. Unsure of a few words here and there? The test prep app allows you to star difficult words for later review. A professor can often make or break a course. Some really bring excitement and innovation to the classroom, while others read straight out of the textbook. Rate My Professors becomes most useful when deciding what courses you want to try to get into and which ones you drop out of before its too late. The self-proclaimed “leading source of professor ratings” offers more than 10 million comments regarding over 1 million professors. Composing a research paper is tough. Getting the citations right and building a bibliography is even tougher. EasyBib is a tool that will automatically create citations for you based on sources provided by you: websites, books, newspapers, journals and even databases. Users can even export to other formats once your bibliography is built. Not everyone going back to school this Fall is attending high school or university. ABC Letter Tracing is an app built for children preparing to enter Preschool. The simple interface and refined visuals are perfect for parents looking to teach their children how to read, write and recognize the basics of the alphabet.